Waterman Group Plc is proud to announce that it has been commissioned to provide advice on two riverside residential projects in West London. Waterman's team, appointed by Pinenorth Properties Ltd, will provide structural designs for the 4.5 acre Teddington Film Studios' riverside site where planning consent has been granted for over 200 residential apartments. This site was formerly operated by Pinewood Studios and is located in a prominent position on the River Thames overlooking Teddington weir. Demolition of the existing buildings is currently ongoing and construction of the new apartments will commence this year. A second commission recently received from Reselton Ltd is for Waterman to provide environmental and structural advice for the planning application for the 22 acre Stag Brewery site adjacent to the River Thames at Mortlake, London. 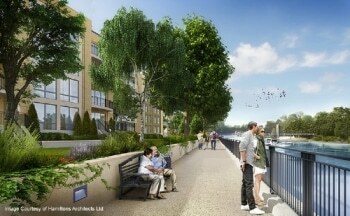 This site, with a 200 metre River Thames frontage, is being developed for residential, retail, hotel and leisure use. Nick Taylor, CEO of Waterman commented; "We are very excited to be involved in these two prominent sites which both benefit from an excellent riverside location to the west of the centre of London. We look forward to supporting our clients and delivering successful developments."